Submitted by Kerry on Mon, 2013-01-28 13:09. Away With the Asperger's Diagnosis: What's It All About? To assess the social and emotional well-being of adopted children, this section reports on whether children have ever been diagnosed with any of four psychological disorders, including attachment disorder, depression, attention deficit disorder/attention deficit hyperactivity disorder (ADD/ADHD), or behavior/conduct disorder. Additionally, we report on the percentages of children who exhibit positive and negative social behaviors. See Appendix Table 8 for detailed data on each indicator. Most adopted children fare well, according to six measures of socio-emotional well-being, but a small minority experience serious problems. Parents’ responses indicate that the majority of adopted children have never been diagnosed with each of the four psychological disorders included in the survey. Twelve percent of adopted children have ever been diagnosed with attachment disorder. The survey did not ask about the severity of the disorder. Most adopted children diagnosed with attachment disorder have parents who report a “very warm and close” relationship with their child, although such reports are rarer than among adopted children without attachment disorder (64 compared with 84 percent). Overall, 4 percent of adopted children both have been diagnosed with attachment disorder and have a parent who reported the relationship as not being very warm and close. The incidence of the other three disorders examined here is lower than for attachment disorder. Fourteen percent of adopted children ages 6 and older have been diagnosed with ADD/ADHD and have parents who rated the condition as moderate or severe. Eight percent of adopted children ages 2 and older have moderate or severe behavior or conduct problems, according to their parents. Parents of 2 percent of adopted children report their child has been diagnosed with depression and currently has symptoms that are moderate or severe. Also based on parent responses, 14 percent of adopted children have problems with social behaviors. However, parents also reported that 88 percent exhibit positive social behaviors. 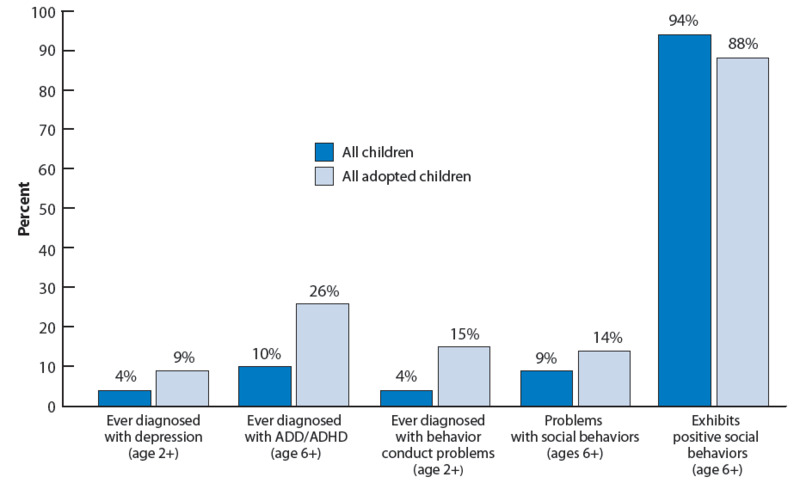 Compared to the general population of children, adopted children are more likely to have ever been diagnosed with—and to have moderate or severe symptoms of—depression, ADD/ADHD, or behavior/conduct disorder.24 For example, 9 percent of adopted children ages 2 and older have ever been diagnosed with depression, compared with 4 percent of children in the general population. Additionally, 26 percent of adopted children ages 6 and older have ever been diagnosed with ADD/ADHD, compared with 10 percent of children in the general population. A similar pattern of differences emerges for behavior/conduct disorder: 15 percent of adopted children have ever been so diagnosed compared with 4 percent of children in the general population. 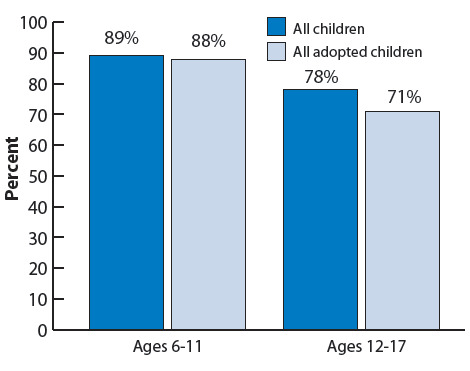 Adopted children are also somewhat more likely than the general population of children to exhibit problems with social behaviors, and are somewhat less likely to exhibit positive social behaviors; see Figure 19. 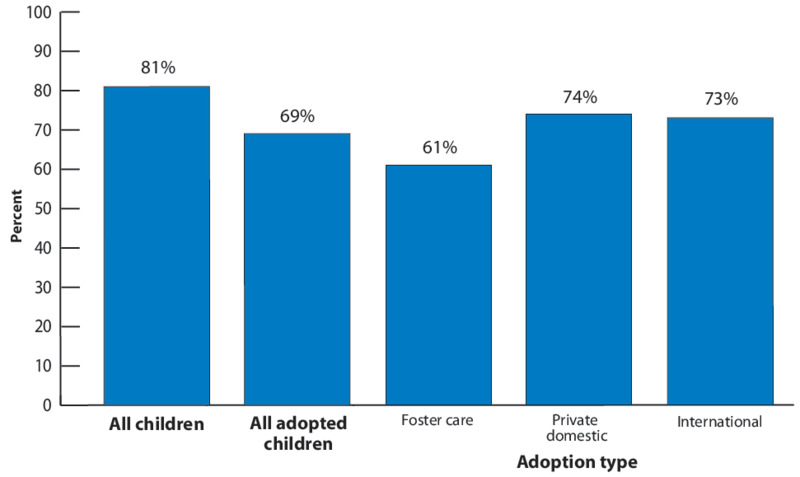 Differences in social and emotional well-being by adoption type are apparent for five out of six measures, with children adopted from foster care more likely to have problems. 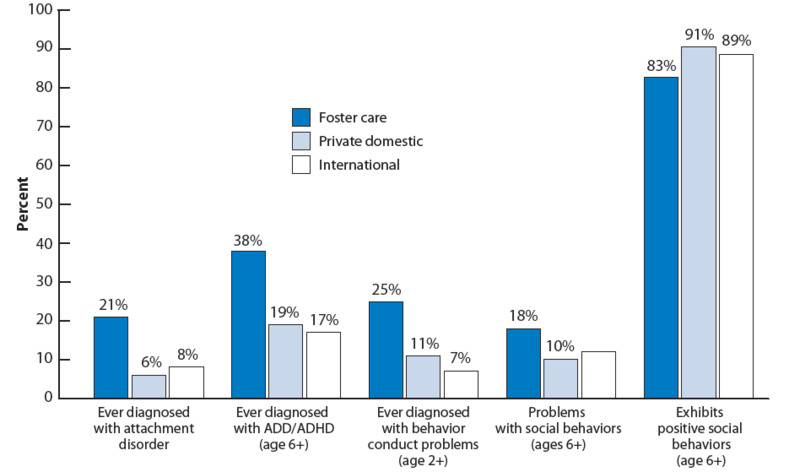 Children adopted from foster care are more likely than those adopted privately from the United States or internationally to have been diagnosed with ADD/ADHD (38 percent compared with 19 and 17 percent, respectively), behavior/conduct problems (25 percent compared with 11 and 7 percent), and attachment disorder (21 percent compared with 6 and 8 percent). Furthermore, children adopted from foster care are more likely to have problems with social behaviors than privately adopted U.S. children (18 percent compared with 10 percent), and they are somewhat less likely to exhibit positive social behaviors (83 percent compared with 91 percent);i see Figure 20. However, depression is rare among all adopted children regardless of the type of adoption. i Differences between children adopted from foster care and from other domestic sources in the percentages exhibiting negative and positive social behaviors are marginally significant (p<.10). To assess the cognitive development and educational achievement of children who were adopted, the Chartbook summarizes parents’ reports on four measures for school-age children: reading/language arts performance, math performance, engagement in school, and whether children spend time reading for pleasure. See Appendix Table 9 for detailed data on each indicator. More than half of school-age adopted children have excellent or very good performance in reading and language arts; the same is true for math. Nearly seven out of ten are engaged in school. Furthermore, about eight out of ten adopted children typically spend time reading for pleasure on a daily basis. Among elementary-school-age adopted children ages 6 to 11, about nine out of ten (88 percent) spent time reading for pleasure. For elementary-school-age children, reading for pleasure is equally likely among adopted children and those in the general population. However, older adopted children ages 12 to 17 are somewhat less likely to have had their parents report that the child spent any time reading for pleasure on an average school day, compared with those in the general population (71 compared with 78 percent, respectively); see Figure 21. Additionally, adopted children are less likely than children in the general population to be engaged in school (69 and 81 percent, respectively); see Figure 22. Parents of children in the general population were not asked about their children’s reading and language arts or math performance. 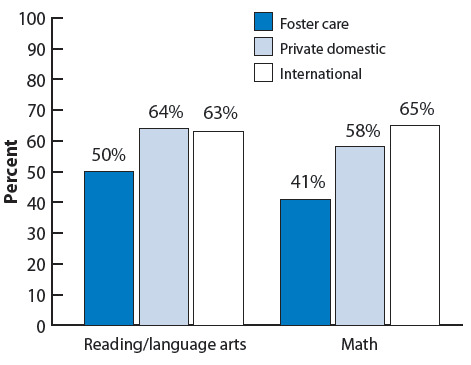 Children adopted from foster care are somewhat less likely than other adopted children to have excellent or very good performance in reading and language arts and in math, and they are less likely to be engaged in school. Fifty percent of school-age children who had been adopted from foster care had parents who rated their reading and language arts performance as “excellent” or “very good.” Similarly, 41 percent had parents who rated their math performance as “excellent” or “very good”; see Figure 23. This pattern generally holds true regardless of children’s ages. Among 6- to 17-year-olds adopted from foster care, 61 percent are engaged in school, compared with 74 percent of those adopted privately from the United States and 73 percent of those adopted internationally. However, reading for pleasure is equally likely for all three types of adoptions among school-age children, both for those of elementary school age (6 to 11 years) and for older children (ages 12 to 17).